To my readers: I encourage you to check out Palate Press, the new online Magazine. Palate Press launched today with the first set of articles, one of which is by yours truly. I am also an editor over there. My story that is up today is Why Did the Wine Bloggers Cross the Road? From off-the-beaten-path Murphys, California, Jeff Stai and Twisted Oak are proving the power of social media in wine. Sonadora reports. Click here to read the whole story. Palate Press is the brainchild of David Honig of 2 Days Per Bottle and our chief editor and cat herder is W.R. Tish of the Wine Skewer. Palate Press gathers together some of the best wine bloggers around as editors and contributors, publishing hot news stories, opinion pieces, and in depth reports on all things wine. Out launch today features six pieces, ranging from mine to a piece on Randall Graham of Bonny Doon’s new book. I will be contributing one unique piece per month which will publish exclusively on Palate Press. I intend to mention that post here every month and will republish it here after a set time period. So in case you don’t get enough of my random ramblings here, please head on over to Palate Press to check out my story as well as the other well researched and written articles! *I am not, in any way, being compensated for articles/editing I contribute to Palate Press. Some wines I tasted at dinner/the Grand Sonoma tasting at the Wine Blogger Conference this summer. I thought it worth telling you about them since I took the time to take notes and many are worth your time to hunt down! Sadly, I didn’t get to taste very many wines at the Sonoma Grand Tasting. The location (chosen I think to pre-empt our poolside party) was not large enough for anywhere near 100 people, let alone 275. I only tasted 5 wines throughout the whole event before I ran for cover from the jostling crowd which wasn’t conducive to talking, tasting, taking notes, or really, moving around! 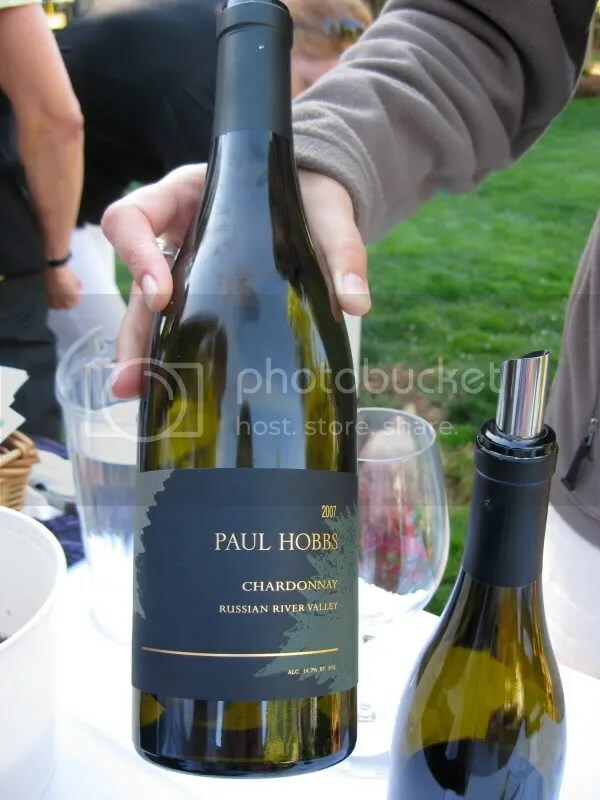 2007 Paul Hobbs Russian River Valley Chardonnay: French Oak. Oak, butter, maloactic, apple, spice, white pepper, nice acidity, good fruit. 2007 Paul Hobbs Russian River Valley Pinot Noir: Strawberry, cherry, raspberry, spice, pepper, tarragon, red fruit, nice structure, tart fruit. 2008 Lancaster Alexander Valley Sauvignon Blanc: Grapefruit, melon, lemon, spice, crisp, nice mouthfeel, tart citrus. Saw 10% oak. 2006 Roth Alexander Valley Cabernet Sauvignon: Vanilla, strawberry, currants, blackberry, black cherry, nice structure, reserved. 2005 Roth Estate Cabernet Sauvignon: Big red nose, herbs, leather, earth, black cherry, blackberry, pepper, peppery, smooth, well integrated. 2008 Titus Sauvignon Blanc: Melon, grass, hay, tart, dry, lemon , citrus. Nice. 2007 Titus Zinfandel: Bramble fruit, blackberry tart, vanilla crea, black fruit, violets, tart, nice ripe fruit. 2007 Sojourn Gaps Crown Pinot Noir: Bright red fruit nose, brown sugar, tart, raspberry, nice mouthfeel, spice, cinnamon. 2004 Michel Schlumberger Deux Terres: Leather, bramble, blackberry, dark fruit, fresh blackberry, spice, tannic. 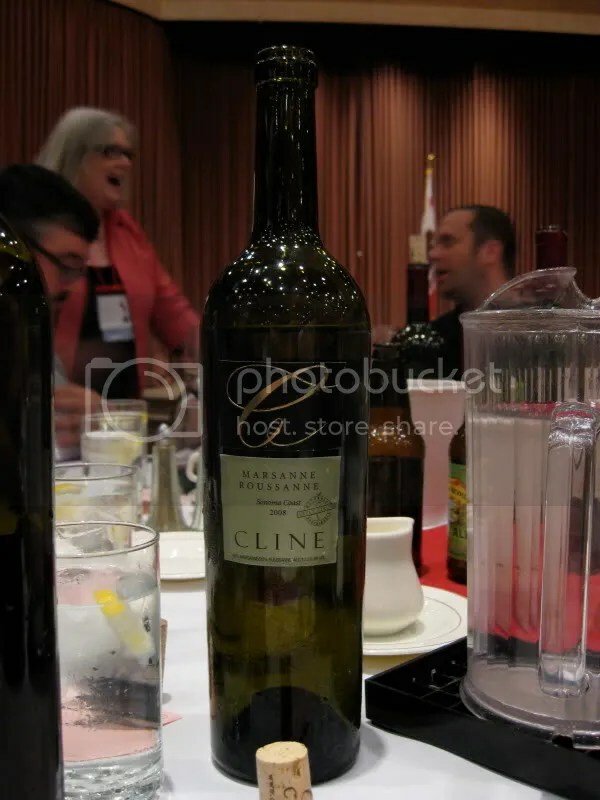 2008 Cline Marsanne Roussane: Pear, orange blossom, spice, honey suckle, spice, orange zest, honey, crisp. 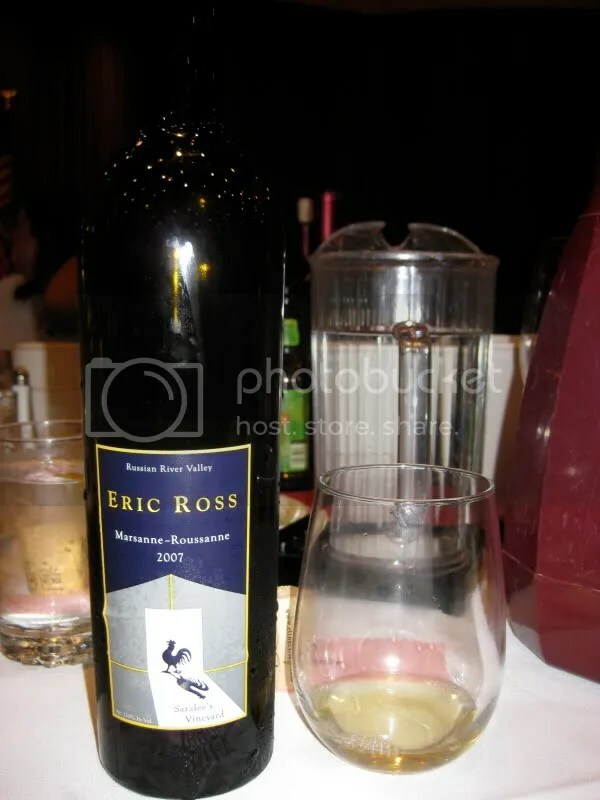 2007 Eric Ross Russian River Valley Marsanne Roussanne: Toasted spice, tinned pear, flowers, grapefruit, really nice acidity, pineapple, caramel finish. One of my top wines of the weekend. 2006 Tytanium Ty Caton: 37% Cabernet Sauvignon, 29% Petite Sirah, 20% Syrah, 5% Merlot. Vanilla cream, blue fruit, violets, pepper, chocolate syrup, tight, blueberries, coffee, espresso. Huge wine. I really wanted to see what this would be like the next day, but it was dark in the dinner room and I accidentally grabbed the wrong bottle on my way out! 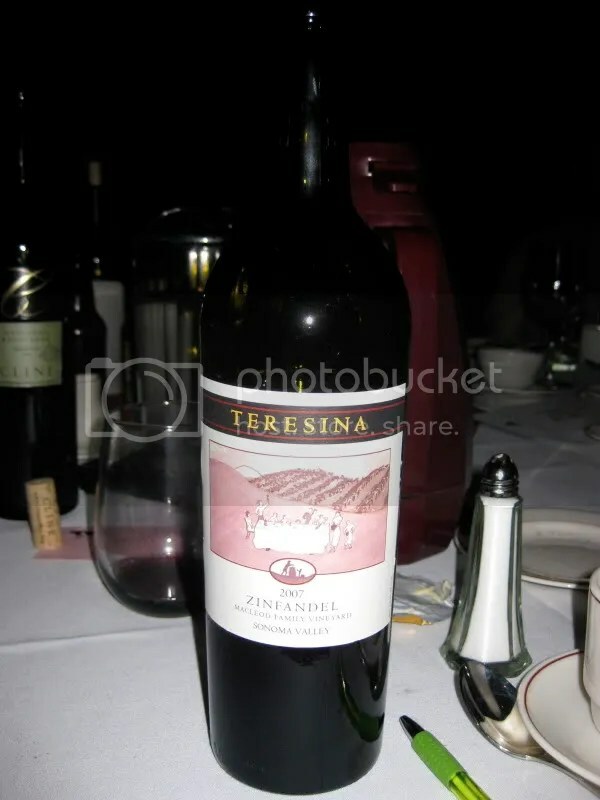 2007 Teresina Sonoma Valley Zinfandel: Raspberry, cranberry, pomegrante, spice, smooth, cherry, hard candy, pepper. 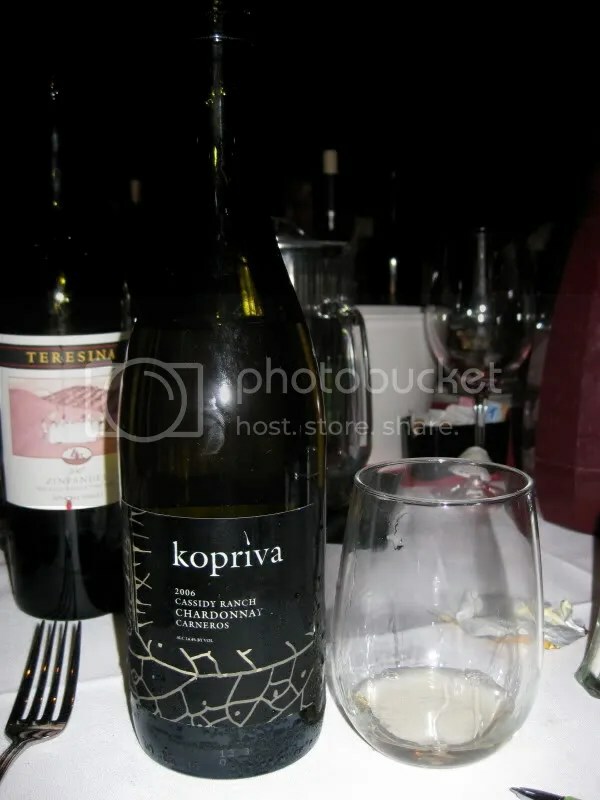 2006 Kopriva Cassidy Ranch Carneros Chardonnay: Spice apple, pear, spice, cinnamon, overripe peach, nice round mouthfeel, with clean acidity, baked apple pice, green apple. 2006 Titus Reserve Cabernet Sauvignon: Vanilla cream, black, tannic, blackberry pie, dusty milk chocolate, raspberry, tart fruit, anise. 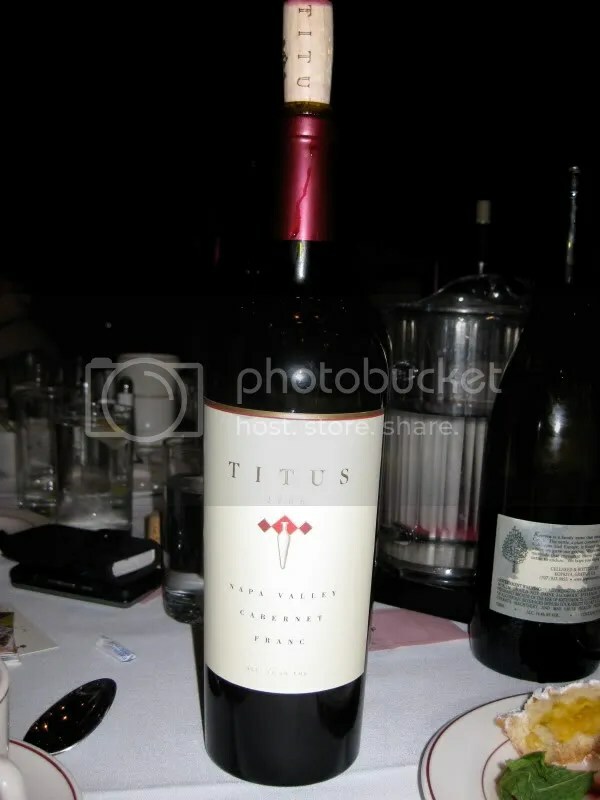 2006 Titus Cabernet Franc: Pepper, herbs, leather, raspberry, tannic, dark, spice, anise, strawberry. Obviously, I was hanging out just a bit with Christophe from Titus, given how many wines from them I tasted and reviewed. Always a good time, Christophe was sporting a ‘hawk at this year’s WBC, taking the place of Ward from last year!